If you think jet lag is a pain, you should try time-lag. Historian Ned Henry is battling a wicked case of it, thanks to his multiple trips to the 1940s in search of information on the Bishop’s Bird Stump, an artifact once housed in Coventry Cathedral but missing since the bombing of the cathedral during the Blitz. The imperious Lady Schrapnell who is funding the rebuilding of the cathedral in 2057 will not let Ned or his fellow historians rest until they’ve made the restoration perfect—time-lag be damned! When Ned starts experiencing Disorientation, Exaggerated Nervousness, Slowness in Answering, and Difficulty in Distinguishing Sounds—all symptoms of advanced time-lag—his boss decides that enough is enough. He will send Ned away on holiday in a place where Lady Schrapnell will never find him, in Victorian England! All Ned will need to do when he’s there is help restore an object accidentally brought forward to 2057. It’s a simple task, but a vital one. Ordinarily, the system that historians like Ned use to travel through time won’t allow objects to be removed from their era because doing so could disrupt the space-time continuum. No one is sure why the system let this one object through, but it’s essential that it be returned before any serious damage is done. However, there is a big problem. Ned, in making a quick exit to Victorian England, is too time-lagged to remember exactly what it is he’s supposed to be doing. What’s more, his quick tutorial in Victorian etiquette and culture doesn’t give him nearly enough information to navigate the tricky social mores of the time. Most of what he already knows seems to come directly from Jerome K. Jerome’s Three Men in a Boat. Lucky for Ned, his early adventures put him on a boat on the Thames, where his little bit of background knowledge may come in handy—or not, if you’ve read the book and know how Jerome and his friends got on. Eventually, though, Ned ends up on shore where he has a whole new set of hilarious challenges—spiritualists, bric-a-brac, jumble sales, beruffled Victorian ladies, exotic fish, butlers, and croquet—to say nothing of the dog, and the cat! Jenny has been after me to read Connie Willis’s To Say Nothing of the Dog for years, and in fact I’ve owned a copy since 2007, which means that, in following my plan of reading all books I’ve owned for 4 or more years, I was determined to get to it this year. When Jenny added it to my list of must-reads in 2011, I decided to put it at the top of my list. And of course, Jenny was quite right that this is a perfect book for me. I cannot adequately express what fun I had reading it! Willis also deserves commendation for her tight plotting. Time travel books obviously require careful plotting, with attention paid to how the characters’ actions in the past might affect the future. Willis has not two, but three time frames to juggle, and she handles them all well. What’s especially exciting about her efforts here is how deftly she works small details into the overall fabric of the plot; as Lady Schrapnell says repeatedly, God is in the details. Lots of running gags and seemingly isolated moments that appear to be added in for a bit of fun and flair end up paying off in unexpectedly significant ways. And then she also works in some musings about fate and individual agency. (Wow! That’s a lot of book in one book! But it never feels overstuffed.) Because Willis plays fair and plants lots of clues about what she’s up to, there were a few surprises that I saw coming, but there were plenty more that I didn’t. Mostly, I just marveled at her ability to put it all together. Now go read it, so you can marvel too! Other blog reviews: Beth Fish Reads, Books I Done Read, Farm Lane Books, The Indextrious Reader, Stella Matutina, Things Mean a Lot, and conversation posts on Booklust and The Adventures of an Intrepid Reader. Great review! You’ve made me want to reread it, stat. Thanks! I think this would make a great reread. Very glad to hear you enjoyed this so much! I also read all her poking fun at the Victorians as affectionate. And oh, all the Lord Peter and Harriet Vane references! So much to love here. The Peter and Harriet references made me so happy! This has been on my wishlist for ages. It sounds right up my alley. I’m glad you found that the plot is tight, but that’s one of my biggest frustrations with authors who go into time-travelling. It’s such fun! And it was amazing to watch all the bits and pieces come together in the end. I gave up on Willis’ Doomsday Book, because I hated the way she portrayed the Middle Ages. But it sounds like this one would be the best option for me to give her another chance! I think you’d like this. Doomsday Book will probably be my next (on Jenny’s recommendation). It’ll be interesting to see what I make of her depiction of the middle ages. I, on the other hand, loved the way she portrayed the Middle Ages. I found it quite realistic. We’ll see what you think! This does sound like fun, especially since I just listened to Three Men in a Boat. Maybe I should brush up my Sayers, too. It’s a perfect follow-up to Three Men and a Boat. There’s more Jerome inspiration than Sayers, but if you’ve read Gaudy Night in particular, you’ll pick up on some nice references. I picked this up from the library this week and can’t wait to read it! This is on my reading list; I recently passed it over at the library, but I see I made a huge mistake. This sounds brilliant. Brilliant is right. Definitely one to grab when you get the chance. Connie Willis is an author that I have been wanting to read for a long time now… I know I even had a copy of this book but perhaps it’s been shuffled off into another time period, because I cannot find it for the life of me! I am not the biggest fan of historical fiction, but I think the way Willis approaches things will be something I can appreciate… plus this doesn’t sound like traditional hisfic, so I think I will like it. Her sense of humor sounds like a good match for mine… I have a copy of Doomsday Book, so I will probably start there! This isn’t traditional historical fiction at all–more of an historical fiction/science fiction/slapstick comedy mash-up. I understand from Jenny that some of her other stuff (including the Doomsday Book) is a bit darker. Yes! Those big questions really took me by surprise. There are Peter and Harriet Vane references? I want that! I only haven’t read this so far because I didn’t like the other book by Connie Willis I read, The Doomsday Book. But if there are going to be Peter and Harriet references, I’ll have to rethink. There are lots of Peter and Harriet Vane references! Almost as many as to Jerome K. Jerome–and there’s some Poirot for good measure. Yay, such a pleasing review, in part because I am full of fond feelings for this book and it’s nice to see that other people are, too. 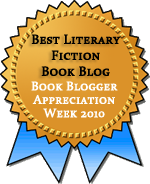 :) I agree w/ Aarti that your description of the book as a “mash-up” is a really good one. And aww Cyril – I’m such a sucker for dogs, in real life and in books, and he was so funny/great. I’m not a dog person in general (I like them fine but don’t seek them out), but I ADORED Cyril. It’s very nice to see that you finally got to this one and loved it! It’s about time for a reread, especially now that I’ve read Gaudy Night…I’m sure going back to this one will be doubly entertaining now. I agree that Willis handles all the interlocking eras extremely well & it is a joy to read. I think this would be great for rereading, especially knowing how all the bits and pieces that seem random are part of the overall picture. And most especially after you’ve read Gaudy Night! I’m so happy you loved this one! (I knew you would!) I usually suggest this one to get people hooked, but I haven’t read anything by her that I haven’t liked. I felt sure I’d like it, too. Thanks for the push to finally read it! I had NO IDEA what this book was about. Sounds very funny….Once my TBR dare is over, I’ll have to find this! It is very funny. I’ll be curious to see what you think! Ha–I love that quote! I think I’ve had this book for as many years as you have! I have wanted to read this for a while and even read Three Men in a Boat in anticipation! I must get to it sooner now rather than later–it does sound like fun. I read Three Men in a Boat ages ago in anticipation of reading this. I’m glad I finally followed up on that! I’ve heard so many good things about Connie Willis’ books and I really must get to them soon. I was thinking of reading Doomsday Book but maybe I’ll give this one a go first:) Time travel is always a complicated thing to pull through in fiction so I’m interested to see how Willis does it. I know lots of people like the Doomsday Book just as much as they do this one, so my guess is that either one would be good to start with. I loved this book, and have every intention of reading The Doomsday Book this year! I think Doomsday Book will be my next Willis, though it may not be this year. I picked up both books from the library last week and I’ll be reading them soon. I really am excited that you lit a fire under me on this one! I’m excited for you! Hope you enjoy. 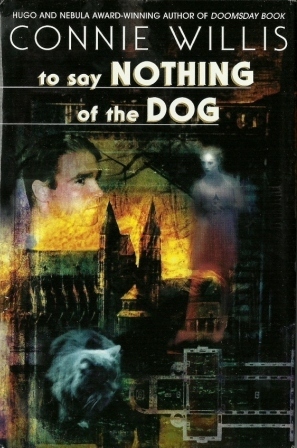 Well, after some pretty firm encouragement from Proper Jenny, a copy of To Say Nothing of the Dog has arrived and I’m loving it and totally sold on Connie Willis. I shot off to the library to see what else they had of hers (Doomsday Book, took it out) and am now roaming around pestering innocent third-parties to get on the Connie Willis stick. I’m not usually up for sci-fi, having inoculated myself at the appropriate age, but I’m certainly up for this: the sci-fi background is the canvas for an outstanding example of the storyteller’s art: P.G. Wodehouse H-H-H-Himself never set up such narrative tension over the petty social intricacies of country-house life. It’s Downton Abbey meets the Flashman books by George MacDonald Fraser, which means the historic and literary allusions come thick and fast and you get history master-classes as a free bonus of reading a rollicking good yarn. Willis clearly had much fun writing this, but what a job of work it must have been to write such an intricate and detailed novel. If I’d written one book, even remotely comparable, I would burst with pride and die happy, but she has produced a whole clutch that I look forward to exploring. To Say Nothing of the Dog rocks. If you haven’t read it, you haven’t lived. Go get on the Connie Willis stick.